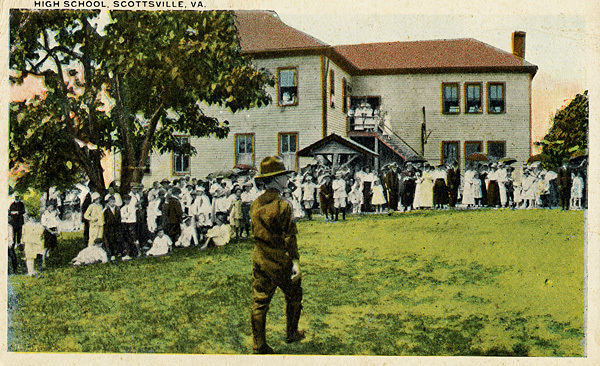 Comments: Pictured above is a William E. Burgess postcard of Scottsville's School on the Hill, dated circa 1918. Susie Blair, a graduate of Scottsville schools, used this photograph to lead off the following school history she wrote in December 1962 for use in Scottsville High School's student handbook. Once upon a time, the Scottsville School was in a large brick building on the corner of Main and Valley Streets, on the spot where the Masonic Building and the Grill are now open. Its front door opened onto the street; its large front windows were painted over to keep the inmates from looking out and passers-by from looking in. At the back where the firehouse and water plant are now, a high board fence surrounded the long bare stretch of playground, the boys carefully separated from the girls, as they played a limited game of ball, or jumped rope close to where Mink Creek runs under what is now the Coin Laundry. Nobody went in or out of that enclosure on a trivial errand such as buying a coke or an ice cream cone. When you were out you were out, and when you were in, you were in. You were summoned or freed by the cracked notes of a bell on top of the building. Lunches were brought in boxes or baskets and placed on a shelf designated for that purpose; each pupil was responsible for his own midday refreshment. The curriculum was simple but thorough, for these were the days of reading, writing, and arithmetic, of slates and copybooks, of well-grounded Latin in the upper grades. The first grades were presided over by Miss Willie Hickock who taught two generations of Scottsville natives. In a long cobwebby room with the big wood stoves, row after row of heads bent over ink-stained desks and well-thumbed readers while an occasional hand was raised to ask for permission to get a drink of water from the tin bucket on the shelf under the blackboard. The rules were rigid, the lessons drilled untiringly. On the other side of the hall, Miss Ella Farrar taught the middle grades, and upstairs the "big" girls and boys were in the principal's room where everybody met in the morning to sing a hymn and say the Lord's Prayer. There was enough approval, however, for the ground to be broken and the cornerstone laid with fitting ceremony. The gray frame building on a lot all its own, high above the town was a great change from the old schoolhouse on the pavement. Miss Ella Farrar and Miss Nannie Hill traveled in state in buggies drawn by reluctant horses, but their pupils chose the shortest distance between the two points and scurried straight up the steepest incline. The hill was veined with private paths including a set of steps dug out at the back from which Miss Willie Hickock climbed into her buggy. Mr. Smith, after long, productive years, retired in 1937 and was succeeded by Mr. Leslie Walton, a graduate of the school and a worthy successor. When Mr. Walton left to become assistant to the County Superintendent of Schools, Mr. Thomas Gillis took his place. Mr. Gillis was followed by Mr. John Boggs during whose term from 1954 to 1958 a gymnasium, a cafeteria, and a laboratory were added to the big building with its growing enrollment. Mr. Thomas Allison, the present principal, was a teacher in the school before he became its head in 1958. Six new classrooms were added in 1962, and the primary school was moved to the main building making one large well-equipped plant.